As Capitol Hill Housing gears up for Friday’s Omnivorous, its biggest fundraiser of the year, the nonprofit housing developer is also starting the packing process. Capitol Hill Housing is leaving Capitol Hill — for a little while, at least — as its current offices inside the Davis & Hoffman building at 10th and Union will be shuttered to make way for construction of a new mixed-use apartment building at the site. CHS reported last week that developer Alliance Realty has bowed to community pressure and backed off plans to demolish the old auto row building currently home to CHH, Pravda and Grace Church Seattle. CHH is still moving its offices to the Vance Building on 3rd and Union. Our last day at Davis Hoffman is October 18th, and we open downtown on Monday, October 22nd. And then we will have a triumphant return to Capitol Hill in 2014, when 12th Avenue Arts opens! 12th Avenue Arts, CHH’s joint project with the city to develop the current East Precinct parking lot into a new facility with SPD parking, apartments, theater space and, yes, offices is slated to break ground later this year. Alliance is scheduled to present its revised plans for the parcels along Union between 10th and 11th at a meeting Tuesday night (September 25th) at 12th and Pike coworking space, Agnes Underground from 5 to 7p. A company representative told CHS she could not confirm the revised plan will preserve the Davis & Hoffman building in addition to the 11th and Union Madison Greetings building already planned for incorporation into the project but people familiar with the situation said Alliance has come up with a new design that preserves significant portions of each building. This building has also been home to the offices of Grace Church Seattle, www.graceseattle.org , for almost 15 years! We’re in suite 102 across the hall from Capitol Hill Housing. While our church rents the Volunteer Park Seventh Day Adventist church for our Sunday worship, we’ve been trying to figure out what to do since they announced the demolition. Our current plan has been to see what happens. Turns out that might be a good plan? Ha. Anyway, just wanted to let you know of another group this news affects. Thanks for keeping us informed. It’d be sad to lose this building. 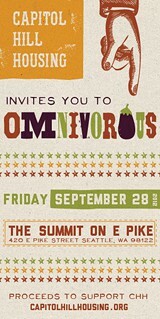 Meanwhile, tickets are still on sale for Friday’s Omnivorous fundraiser for Capitol Hill Housing. $80 will get you unlimited plates prepared by an all-star cast of Capitol Hill food+drink notables. Keeping it local, tickets are available via Stranger Tickets. New-ish E Pike event space The Summit hosts. The fun runs from 6-10p, Friday, September 28. The evening will include a special opportunity to hear from one of our residents and make a financial contribution to support Capitol Hill Housing’s new Resident Services program. Omnivorous is produced by the Capitol Hill Housing Foundation. All proceeds from the event will benefit Capitol Hill Housing.